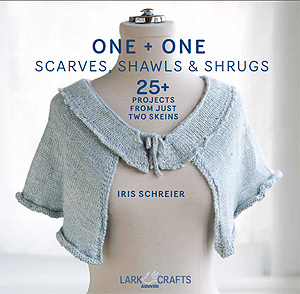 A sparkling shrug perfect for a spring or summer wedding, makes a wonderful knitted with love Bridal gift, or a fabulous accent piece for your own wardrobe. 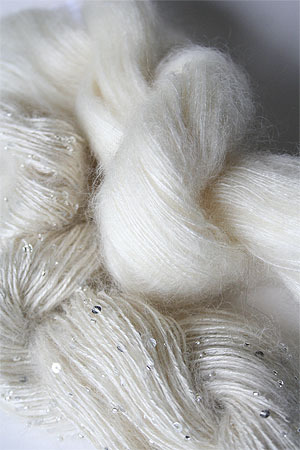 Shown above in Snow white, this can be made in any of the colors of these beautiful yarns - it's not just for weddings! Like snow, or whipped cream - shown at left in 250 and 250 Silver, the colors used in the project photo in One + One. Gorgeous. Note: Above colors are solids, but because they are painted by hand, these yarns still will have some tonal variation. Every color is unique!